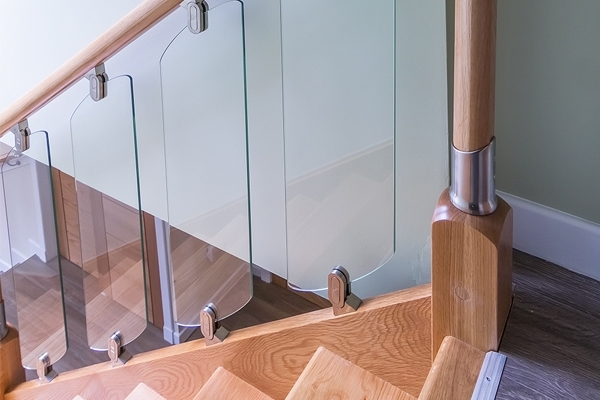 Here at Pear Stairs, we sell a huge range of balustrading for landings and stairs. Some of our popular modern styles of balustrade incorporate glass panels between the handrail and baserail, rather than standard spindles. Our glazed balustrades are available in various styles with choices for metal and timber parts to be used alongside the glass. Whether it be on a balcony or a terrace, you’re bound to have seen glass balustrades before. 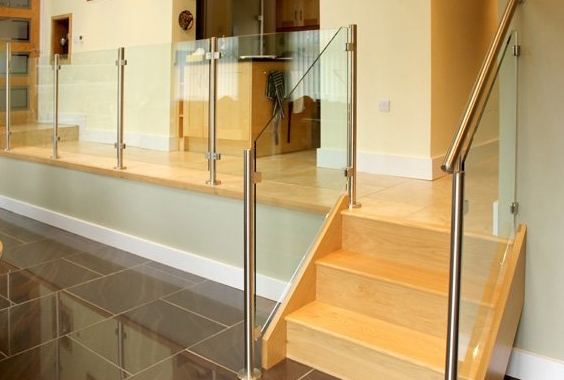 The landing glass balustrades that we supply, here at Pear Stairs, are designed with your specific needs in mind. Remember we can also supply balustrade for stairs. Our range of glass balustrades is tailored to suit project requirements, enabling you to create the desired finish that you’re looking for. The simple addition of a balustrade, made from glass, will combine style and sophistication with functionality and practicality. At Pear Stairs, we supply glass balustrades to create an illusion of extra space; making them perfect for any property. The sleek, versatile design of the balustrades is balanced with style, practicality and cost, essentially providing a modern finish to your home or business. Any of the glass balustrades that we design, manufacture and supply at Pear Stairs encompass beauty and transparency to maximise the natural elegance of glass. Our balustrades are designed to be visually enhancing and offer timeless elegance, offering suitability for almost any location. We make some balustrading entirely out of metal and glass, for an ultra-modern look, with the highly versatile parts from Q-Railing, an innovative brand in the field of railing systems. These parts offer complete solutions that are immediately recognisable due to their unique design, exceptional performance and fine quality. The Q-Railing ranges are ideal for residential and commercial properties and we have the parts to build their baluster railing systems, used to construct the perfect premium glass balustrade. These systems are designed to be easy to construct. However, some are not recommended to fit this up a staircase due to the nature in which the base channel needs to be anchored to the ground. Consult our team for information. See the bottom of the page for some details on some of our Q-Railing parts designed to work with round profile handrails. 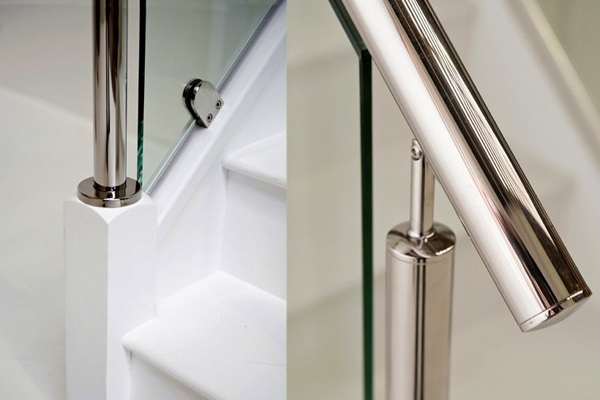 Although we only have a limited selection of these railing parts currently listed on our website we can supply the full range of parts from Q-Railings that allow you to build glass balustrade for internal and external installations, simply discuss your options with our design team.. Here at Pear Stairs, we are an official supplier of Richard Burbidge stair and handrail parts and we have been working closely with them form many years. 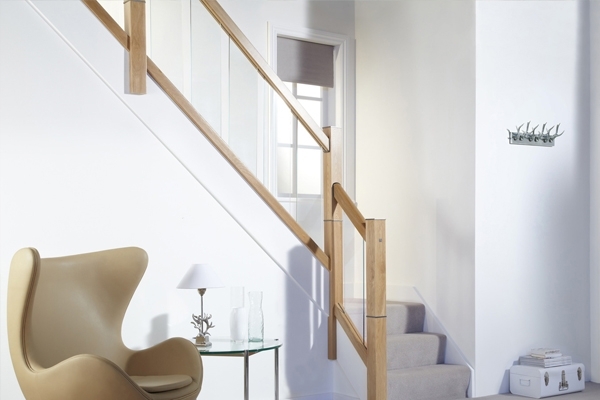 Richard Burbidge has adapted a few of their ranges to incorporate glass panel balustrade with their more classic timber parts. The Fusion residential and commercial ranges have glass options, as well as the Elements and Immix ranges. This means we can offer plenty of choices when replacing or renewing a stair or landing balustrade with something fresh and modern looking. The popular Fusion range provides a quick and easy way to update your balustrade or install a new one. The inventive, ready-to-fit system enables you to quickly connect everything together, so in many cases, you will be able to transform your stairway in just one weekend. These parts have a distinctive modern look and give you a choice of clear glass panels or the Fusion metal spindles. The panels are easily attached with metal brackets - choose between a chrome or brushed nickel plated finish. The Fusion Commercial range is tested to a higher specification, making the parts suitable for a wide range of applications, including in high traffic commercial situations. The glass in the commercial range is clear 8mm toughened glass to BS 6206 (EN12150) for extra strength. The versatile Elements stair parts collection was originally designed to work with the elegant black spindles but can also be used with the metal spindles or glass panels form the Fusion range to increase the range of glass balustrades we can currently offer. The Elements range is suitable for use on staircases with a pitch of between 40° and 43° and is ideal as a landing balustrade. The 200mm wide panels are made from 6mm toughened glass, offering plenty of side protection to users, and are fixed in place using contemporary metal twist brackets with a brushed nickel finish. 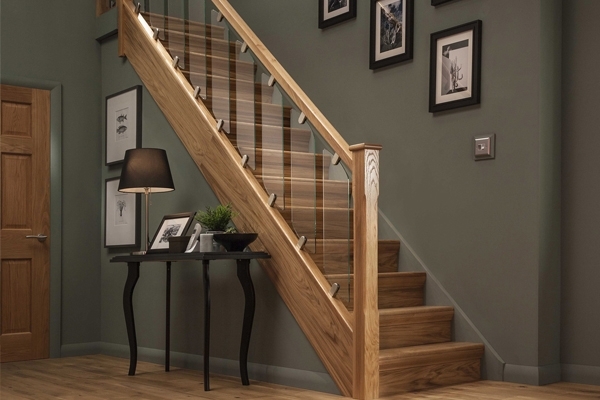 The premium Immix range offers a great way to refresh your stairs and bring your home bang up to date by changing the balustrading for a whole new look. With clean, elegant lines and innovative styling, these stylish handrails will breathe new life into your hallway or living room. Their contemporary look also makes them ideal for new builds. The Immix system gives you a choice of continuous over-the-post or post-to-post handrail styles. Unique gun-metal connectors are designed to join all stair parts together quickly and easily, saving time and effort, and with no need for any wood-jointing skills. We currently only have a limited range of Q-Railing parts to view online, contact us to discuss other options, including external handrail and barrier systems. The Stainless Steel handrail is 42.4mm in diameter and is suitable for indoor use only. A rubber profile (see below) is used to fit the handrail to the 15mm glass panel. The rubber interface is designed to fit snugly inside the handrail and to "pinch" the top of the 15mm glass panel. No silicon is required as the handrail, rubber and glass will be a good tight fit. The Corner piece is used to join two handrails at a perpendicular angle to each other.The application of small amounts of adhesive (available in our shop) is required to secure the fitting to the handrail. The aluminium profile base is the final connection point between the glass panel and the floor. It is a rigid design which holds the glass firmly in place, thanks to some rubber inserts (see below). The anchor bolts required for securing the base to the ground can also be purchased from our online store. The profile bases are available in lengths of 2.5m. The M12 anchor bolts secure the base profile to the ground. 24 anchor bolts are required for each profile base length (2.5m). The corner piece is used to join two aluminium profile bases perpendicularly. The end cap adds the finishing touches to the glass balustrade and is easy to fit. The base channel end plates complete the finish of the balustrade. The team here at Pear Stairs are always on hand to help if you require any assistance choosing or designing a glass balustrade. 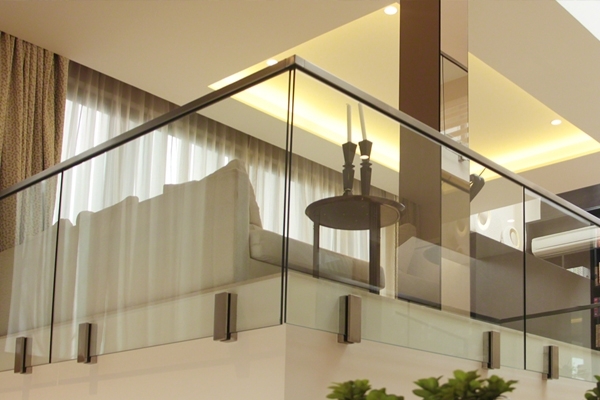 Specialising in the design, manufacture of glass balustrades, you can rest assured that you’re in safe hands. Like any of the products that we supply, the glass balustrades are manufactured to the highest quality, using only the best materials. The glass balustrades that we provide are designed to match your exact requirements, at Pear Stairs we work with you throughout the entire design process, making sure that your balustrades fit perfectly and are to your exact design.